Muhanid is a 23 year old Saudi physics prodigy. He has 22 inventions under his belt, nine of which are patented, and he’s written three books. He first started inventing when he was in sixth grade. His most known invention is a submarine that can submerge itself underwater to depths lower than any other submarine in the world. Before Muhanid’s invention the Japanese held the record. Another invention of his is a pen for the blind. He is originally from the south-western region of Jezan and grew up in Jeddah. His father is a presenter on the Saudi broadcast channels. In April of last year Muhanid was involved in a car accident on Al Ouraba street in Riyadh. At the time, he was a newlywed, he had just gotten married five days earlier. Unfortunately he lost his sight, hearing in one ear and a leg in the accident. And witnesses say that the loss of his leg was due to the slow response of the paramedics and later bureaucratic procedures at the hospital he was taken to. As he was recovering, his wife would sit next to his hospital bed crying and he turned to her and told her that everything was going to be alright. Psychologists that saw him after his accident remarked that they rarely come across patients who were able to deal so well with what he had gone through. Now Muhanid has beaten the dirt off and gotten right back up. He is currently sponsored by the Saudi Telecom Company and back to pursuing his dreams. He also speaks at local schools, urging students to go after their ambitions. My nephew attended one of Muhanid’s talks and he couldn’t stop raving about him. He says meeting him was inspirational and that Muhanid gave the students his Email and told them that they could contact him if they ever needed support. Ms. Huwaider started off as an employee at Aramco with an occasional piece published mostly in Al Watan newspaper. She’s a divorcee and mother who had accompanied her then husband for studies in the USA and I believe that life there had had a huge influence on her. Her presence as an activist snuck up on the Saudi government and the religious establishment until they finally resorted to banning her from all forms of Saudi media in 2003. On August fourth 2006 she took things into her own hands and single-handedly staged a protest by walking on foot with a poster demanding Saudi women rights on the King Fahad bridge between Bahrain and Riyadh. She was stopped and detained for questioning by the Saudi government for six hours. That same year she tried to get a group of Saudi women to organize a protest in the Eastern region where they would all drive cars. Unfortunately they backed out at the last minute. In 2007 she and three other women started a petition for women driving and they even went to the malls and the streets to get signatures. Three weeks into the petition they were able to gather 1100 that they then DHLed to the King’s office in Jeddah. However, what she is most famous for is the video last year in which she drove a car in the Eastern region of Saudi Arabia and at the same time addressed the King in a plea to legalize women driving. Many Saudis criticize her because they believe she is out to air Saudi Arabia’s dirty laundry in front of the world. I think that these people are not aware that she has extensively written about these rights in Saudi media and in Arabic and that she is currently banned from doing so. Her Arabic writing is emotive and seems almost like poetry. She definitely has a talent for it. But that sort of writing in Arabic when writing about anything outside of religion rubs our conservatives the wrong way. They can’t even take logic and science if it disagrees with them. When I asked a group of my mother’s generation about her, they called her subversive, disobedient, and disloyal to her religion, family and country. They also felt bad for Huwaider’s parents. And a group of women of my generation didn’t know who she is and after telling them, they shrugged their shoulders. I guess they are more aware of whatever they are currently showing on MBC 4. I also asked my husband what he thought of her and he just frowned. I think he’s worried that there might be an inner Wajeha lurking inside of me, squirming to get out. Most likely she won’t be appreciated and celebrated until my daughter’s generation and only as long as a Taliban-like government doesn’t take over and execute her or throw acid in her face. She told Turki Al Dakheel in a 2007 TV interview that she gets lots of hate mail with prayers that she contracts a deadly disease or at least gets her hand cut off. She also said that websites hosting her writing have been hacked several times. Huwaider is a woman to be respected for her sacrifices. She had a stable life as an educated married mother and she sacrificed it for the women of her country. If you are interested here’s a link to a BBC radio interview she did in February. What Huwaider is calling for in women and labour workers’ rights will never take root in Saudi Arabia unless a mass of the population calls for it. Why would the government rock the boat when the heard majority is happy with things as they are? Sheikh bin Othaimeen was born in Onaiza, Al Qaseem region in 1929 and passed away in January of 2001. Qaseem is north of the capital and one of the most conservative parts of Saudi Arabia. It is said that his grandfather had a vision of receiving a torch from Bin Taimia, a foremost Islamic scholar, and the vision was interpreted that he would have a son or grandson that would be a great Islamic scholar too. I would just like to note here that Bin Taimia came before Sheikh Mohammed bin Abdulalwahab and so even then the latter was not in the equation. Sheikh bin Othaimeen is, to the highest degree, a respected Sunni Muslim scholar. So much so that whenever I am in a discussion about an issue with a fellow Saudi, many of them treat the Sheikh’s word on the topic almost the same as if it was the Prophet Mohammed’s (PBUH). Saudis and other Muslims reading this will take offence but it is nevertheless true. It is easy to understand why though because Bin Othaimeen was genuine. He didn’t care about money or fame, he truly was devoted to teaching and studying Islam. So much so that while his own family lived in a simple house built the traditional Saudi way out of mud, he hosted a school of students who came from all over the world and paid them stipends. All that was expected of them was to learn the shiekh’s version of Islam. His overall influence on Saudi legislation and day to day lifestyle is immense, especially in the central, north and south regions. Although other sheikhs were coming to the same conclusions that he made or at least agreed with him, he was the foundation for an Islam that is based strongly on pre-Islamic regional customs and traditions. He was so popular that the kings of Saudi Arabia visited him at his home. Another major trend that he helped set is the whole “the infidels are out to get us” ideology; a Western ambiguous “they” whose mission in life is to corrupt us and move us away from our Islamic lifestyle. I never could wrap my mind around this one because if I were a foreign government with interests in another country, I would rather have that country’s people living like monks or nomads and uninterested rather than aware and educated. That way the people won’t interfere with what the foreign governments are getting out of their fields. But to Sheikh Othaimeen our country’s resources were not as big an issue as the puritanical social and moral fabric of our society. Maintaining the status quo became a religious duty. Learning English was not to educate ourselves but to guard ourselves from the “they” infidels and to help us occasionally preach to the ignorant semi-Muslims and infidels. According to the Shiekh, anything that would look like an imitation of the West should be religiously prohibited, including clothing and general lifestyle choices. His ideology is the real reason why women are banned from driving. And his fatwas were among the first to use the gender mixing argument. Whether we like it or not his teachings still have a deadlock on our society. The only light at the end of the tunnel is that we remain stable for at least a decade while still being exposed to the world through all these new forms of media. Once society gets it through its head that there are no evil “they” out to get their religion, then they’ll be able to see the rest of the world with compassion and be open to taking their place within a more inclusive view of the world. Rania Al Baz might be a prominent Saudi but is far from liked by Saudis. She used to work as a presenter on the Saudi national channel. In April 2004 she was seriously beaten up by her husband. After a photo of the aftermath was published in local media, sympathy came pouring in. Her hospital bill was taken care of by a member of the royal family. Her husband was duly punished and she was granted custody of her two sons. She also has a daughter from a previous marriage. There were people who raised doubts about why her husband got that angry in the first place. There were even rumors that she was on the phone flirting with another man when her husband came in. Lucky for Rania, the husband lost a lot of his credibility when he shot at his sister in Egypt and then kidnapped her in Lebanon for singing. This is a video of an interview that the couple did on an MBC program soon after the beating. Rania made a full recovery. She then was given jobs on Al Arabiya and then on the Lebanese channel Future TV. She lost some of her Saudi backing and fans when she decided to appear publicly without a headscarf. But generally she was on the right track up until her Oprah interview. On that show Oprah interviewed women from all over the world, all of them positive representatives of their countries except for Rania. Everyone back here was justifiably offended. Why couldn’t they have chosen someone else; Mona Abu Sulieman, Dr. Salwa Al Hazza, Lubna Olayan, Dr. Maha Al-Mounif, Rusha Al Hoshan…etc. It’s like bringing in Natascha Kampusch to represent all Austrian women. Anyway if you want a complete rant on the topic, read this post. If Rania had condemned the Oprah episode, then she could have gained back a little of what was lost. Even the journalist who arranged the interview was unhappy about how it was edited. Rania on the other hand issued a statement to local press that she was satisfied with the show and that Saudis should not be so sensitive. That coupled with a memoir, originally published in French, which portrayed her whole life in Saudi Arabia as one great big tragedy really pushed Saudis away. It seems as if she used her calamity as a ticket to victim-hood fame. If she had truly cared about the plight of Saudi domestic violence victims, she would have written her memoirs in Arabic rather then French. She could have done more interviews locally rather than joining the rest of the world in their Saudi bashing. Ideally, she could have taken advantage of the initial surge of Saudi support to start a hotline, association, or/and a center. Instead she chose to publicly take off her hijab and to be interviewed reportedly drinking and smoking. Rather than help other Saudi women in her position by raising awareness within the country, Rania willingly and purposely became the global poster-child for anti- Saudi Arabia and anti- Islam. Princess Nora is the founder of Saudi Arabia’s sister. She was a year older than him, born in 1875. 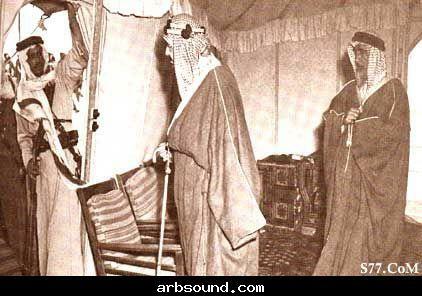 The photo above is of King Abdulazziz on the right and Prince Saud Al Kabeer (P. Nora’s husband) on the left. She had great influence on King AbdulAzziz and historians write that she really urged him to leave Kuwait and try to get control of Riyadh. Afterwards she became one of his main advisors and he was famously known to say on several occasions “I’m Nora’s brother”. King Abdulazziz also gave his sister a role in raising his sons; whenever anyone of them did anything wrong as a child he would send them to their aunt for discipline. Dame Violet Dickson on meeting Princess Nora stated that she was one of the most important personalities of the Arabian Gulf and commented on how charismatic she was. John Philby was also impressed by the princess and commented that she was the first lady of her country. She was known to be quite progressive and outspoken. When the telephone first came into the country many Islamic purists thought it was a tool of the devil but she supported its installation and told the people that it was an amazing device that they will not be able to live without. She was also a poet and had written several poems, the most famous of which is the one she wrote when her husband left her behind for travel. Princess Nora passed away in 1950. A few weeks ago King Abdullah honored his aunt’s memory by naming the first university in Saudi Arabia for women only Princess Nora bint Abdulrahman University for Women. This is another photo but it isn’t of Princess Nora but I still imagine it isn’t far off from what she would have dressed like. 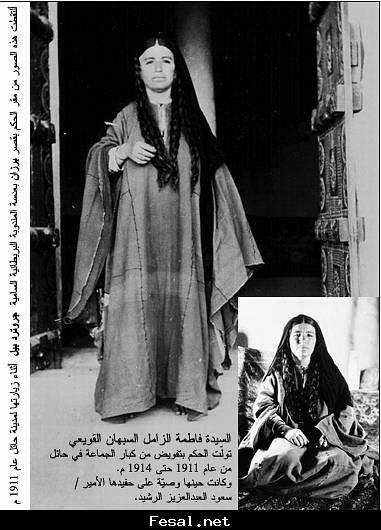 This is of Fatima Al Zamil who ruled Hail (a province north west of Riyadh) from 1911 to 1914. The photo was taken by Gertrude Bell.